The Northern Jaguar Project suffered a tremendous loss in April 2013, with the passing of Peter Warshall, NJP’s science coordinator and a founding board member, following a four-and-a-half year struggle with cancer. Peter’s amazingly wide range of biological knowledge combined with his down-to-earth practicality and incisive negotiating skills made him a crucial member of the NJP team. His dedication to this project and his eloquence speaking on behalf of the northern jaguar was an inspiration. Born in El Paso in 1943, while his father was serving in the Army Medical Corps on the Pacific front, Peter spent his later childhood in Brooklyn and graduated from Harvard in 1973 with a Ph.D. in biological anthropology. His educational experiences varied from living with baboons in Kenya to spending two years in Paris, where he received a Fulbright to study with Claude Lévi-Strauss at the Sorbonne. As a young man he moved to California, where he guided bird tours, conducted plant surveys in Mexico, was science editor for the Whole Earth Catalog and Co-Evolution Quarterly, designed septic systems, wrote the first book about the ecology of septic disposal, and served as an elected official in the town of Bolinas, where he implemented the first total recycling sewage system with settling ponds that still attract bird watchers from around the nation. 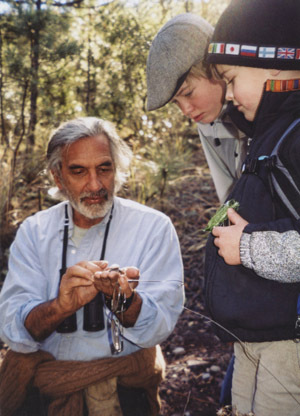 After moving to Arizona in 1980, Peter worked at the University of Arizona’s Office of Arid Land Studies, traveling to Mali and a dozen other nations throughout the Sahel to conduct ecological research projects. During the Ethiopian drought, he worked for the UN High Commission on Refugees, attempting to improve conditions and resolve ecological impact problems. After his co-discovery of Arizona’s endangered Mt. Graham red squirrel, Peter worked for years with the Apache Survival Coalition to prevent the destruction of the mountain’s ecosystems. He taught eco-poetics at Naropa University in Boulder and natural systems analysis for the Presidio Graduate School’s MBA program, always giving classes outdoors. He designed the savannah ecosystem and selected the animals for Biosphere 2. In the late 1990s, he returned to Whole Earth as editor of the magazine. Most recently, he directed Bioneers’ Dreaming New Mexico project, a systematic assessment of the state’s agricultural and energy policies with proposals for their restructuring based on eco-regions. He was working on a book on the evolution of color on the planet when he died. Peter’s wide experience as a naturalist and natural systems analyst gave him a broad view of the complex interrelationships of northern Mexican ecosystems. He had a keen understanding of the variety of research required to protect the northernmost population of jaguars, insight into the conservation and restoration programs needed to improve overall wildlife habitat, and compassion for both the human and non-human residents of the region. Peter remained totally dedicated to NJP throughout his illness. During 30 months of various chemotherapies, he attended board meetings in a reclining chair, wrote grant proposals on a laptop while lying in bed with his two black cats purring at his shoulders, met with ornithologists and botanists around the kitchen table before they set off for the Northern Jaguar Reserve, and provided daily input on all of our projects at the reserve and in the surrounding community. Days before he died, he was still charting out future activities to move NJP’s mission forward. The large shoes he left behind and his position as science coordinator will be filled by an advisory group with a variety of scientific specialties, individuals Peter himself recommended. From the first time Peter visited the area that became the Northern Jaguar Reserve, he was awed by its stunning biodiversity and wild beauty. He committed a decade of inventive, thoughtful, informed work to protect the reserve and all its residents. If you wish to continue Peter’s legacy, you may donate online to the “PWTurtle Fund,” established in Peter’s memory and named for his “totem animal” (he urged everyone to adopt and protect a totem critter). This restricted fund will support upcoming land purchase and NJP’s Stewardship and Long-term Management Fund. Many thanks to all who have already contributed in his memory. Hear Peter discuss some of his various projects at the links below. We regret we never videotaped his dynamic, engaging presentations about the Northern Jaguar Reserve. If you attended those, you know how remarkable his commitment to the northern jaguar was and in part why the reserve exists today.